I just came back from my time off. During that time I spent two days in Philadelphia to go to my first American Numismatic Association (ANA) show. Living a few hours away, I thought it would be a good chance to check out the show. UsualIy, the show are out west or down south. I went to Philadelphia back in the late 80s and early 90s when I was working in New Jersey. Back then I spent a lot of time in Old City and visited Independence Hall and the Liberty Bell. Oddly, I never went to the US Mint back then. It wouldn’t be until 2017 till I entered the Mint. If you ever have an extra hour in Philly, I suggest visiting it. Anyway, this would be the first time I stayed in Philadelphia. The following is my full day in Philadelphia, August 14, 2018. The image above was the view from my hotel room at the Alexander Inn. I think you can see some of City Hall at the very right side. As you can see, Philadelphia has some old as well as more recent structures. Many of the streets near the hotel were tree lined which you don’t see in the center of many cities. The hotel I stayed at was nice. The room was small, but enough for me. I’ve been to hotels in cities before, but this was probably the best. The Convention Center where the ANA Show was being held was only a few blocks away. So, I had plenty of time to get there as it didn’t start until 1pm. Given the time, I was able to go to one of my favorite places in Philadelphia, the Reading Terminal Market. If you are looking for breakfast or lunch, and are not sure what you want to eat, the Reading Terminal Market is for you. Of course, you would expect Cheesesteaks and Dutch meals, but they have much more. If you walk around the whole building, you’ll find Greek, Italian, Mexican, Middle Eastern, Chinese, Thai, and more. The nice part about this place is the location. It’s close to Old City and right across the street from the Convention Center. I probably spent over an hour in here, but finally, I would leave and head for the Convention Center. Finally, I make it to the ANAs 2018 World’s Fair of Money. As you can see, there were many attendees on the first day. In fact, it took me a half hour to get in. This was the largest show that I had been to. I think the largest show I had attended before this was the Bay State Coin Show in Boston back in the 1990s. I got to talk to a few people while I was there. One man was showing me his Indian Gold Eagle. It was beautiful. He asked me if I was going to look for anything like this. I said maybe someday I’ll be able to get one of those, but today was not that day. Morgan Dollars – No surprise here. No matter what show you go to, there are plenty of Morgan Dollars, but I wouldn’t be surprised if there were thousands of them here. I think I saw an 1893-S but no 1895 Proof. There could have been one there, but I didn’t see it. Early Commemoratives – No kidding. I saw a lot of the early commemoratives between 1892 and 1954. I didn’t realize they were that popular. If you were considering to doing a commemorative type set, you would have found many of them here. Foreign Coins – Do you like collecting coins from different countries? There were many dealers selling them. I couldn’t tell you how many countries were represented, but there were many. So, what did I end up buying? 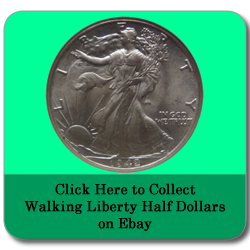 In keeping up with building my Walking Liberty Half Dollar Short Set, I purchased three more in Mint State 64 giving me a grand total of 8 halves. That leaves me with 12 to go. The 1942-S is one of the tougher ones to get. So, I glad I found it. I did find one 1941-S there, which is the priciest one of the bunch. I would have gone for it but it was $75 more than I expected to pay for it. I can wait. There were people from PCGS and NGC that could evaluate, grade and seal your coins. Not sure how long it would take for them to get it back to you. There were auctions throughout the week. One popular coin that was to be auctioned was the 1792 Washington Gold Eagle. Supposedly, this was a unique coin and was owned by George Washington. Strange that Washington accepted it since he didn’t want coins to have his image on them. If there was only one, maybe he didn’t mind. They had a kid zone where kids could learn about and in some cases win coins. They also had seminars for the adults. After attending the show, I took the subway down to South Philadelphia, to see a baseball game at Citizens Bank Park. The Philadelphia Phillies were playing the Boston Red Sox, and woo hoo, the Boston Red Sox won 2-1. This was a nice day, even with the heat and humidity of an August day. There was a little rain before the ballgame which made it comfortable to watch throughout. If you ever have a chance, go to an ANA show. You may see coins that never saw before. You’ll definitely see many, many coins. You can talk to experts who know a lot about coins and you will learn something you never knew before. I hope to be able to attend one again. Maybe spend more than one day, but this time one day was enough for me. Also, Philadelphia has the US Mint and lots of museums to go to. I was hoping to get on one of those buses that you can sit on the top and view everything around Old City and Center City, but it was too hot. I would have never made it through the 90-minute tour on top of a bus. Maybe next time. Hope to make it to one of these shows one day. Sounds like a great time! It’s definitely worth going to!